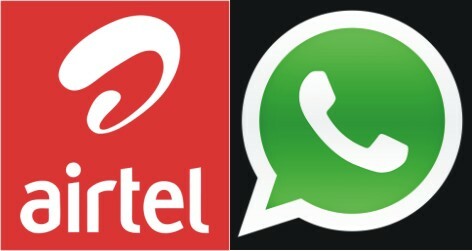 WhatsApp, One of the most popular Instant Messaging Applications in the world can now be used unlimitedly on your Android Phone and even on other SmartPhones with the help of Airtel. If you are not familiar with WhatsApp before, WhatsApp is a Mobile Instant Messaging Application available for various platforms, through which you can send and receive SMS & MMS from other WhatsApp users for free but note that WhatsApp works strictly with Internet Access. Now, you don't have to worry too much about the internet you need on your phone before you can use WhatsApp because with just #100 per Month, you can now enjoy using your WhatsApp unlimitedly with your Airtel SIM. Isn't that a great offer ? Yes it is. So, how do you subscribe for the WhatsApp unlimited package ? Recharge #100 on your Airtel SIM. You will get a confirmation message that you've successfully activated the unlimited WhatsApp on your phone. Now, you can start using your WhatsApp unlimitedly. Maybe you want to chat with me on WhatsApp ? Well, you can add me via +2348167240799. Do you have any problem using WhatsApp on your phone ? kindly drop your questions and complaints in the comment box below, I'll be glad to help. I Hope you are going to enjoy this amazing offer as long as it lasts. Enjoy !!! I guess your SIM is not eligible like they said, try using another SIM. WhatsApp calling has not been introduced when they launched this tab back then but I think the WhatsApp call and downloading of pictures should be included in this plan.